Q: Is the anesthetic safe? Preanesthetic blood testing can be important in reducing the risk of anesthesia. Blood testing before surgery helps to ensure that the liver and kidneys can handle the anesthetic. Pre Anesthetic from WDDC on Vimeo. Even apparently healthy animals can have serious organ system problems that cannot be detected without blood testing. If there is a problem, it is much better to find it before it causes anesthetic or surgical complications. Animals that have minor dysfunctions will handle the anesthetic better if they receive IV fluids during surgery. If serious problems are detected, surgery can be postponed until the problem is corrected. At this time we do not require preanesthetic blood testing for young healthy patients - however it is always an option to help minimize anesthetic risk. It is important that surgery be done on an empty stomach to reduce the risk of vomiting during and after anesthesia. You will need to withhold food for at least 8 to 10 hours before surgery. Water can be left down for the pet until the morning of surgery. Q: What will happen to my pet once I drop them off? A: Prior to surgery your pet is examined and given preoperative medication. This medication is often a combination of drugs to help calm and relax the patient as well as medications that will alleviate pain. Your pet is then "induced" into a surgical plane of general anesthesia. This is usually accomplished by giving you pet an injection of an induction agent in the vein. A tube is placed down your pets throat to protect the airway and allow us to administer oxygen and the inhalant anesthetic agent. At this point the area that is to have surgery will be shaved and scrubbed so that it is ready for the surgeon to operate. Q: Will my pet have stitches? A: For many surgeries, we use absorbable sutures underneath the skin. These will dissolve on their own, and do not need to be removed later. Some surgeries, especially tumor removals, do require skin stitches. With either type of suture, you will need to keep an eye on the incision for swelling or discharge. Most dogs and cats do not lick excessively or chew at the incision, but this is an occasional problem you will also need to watch for. 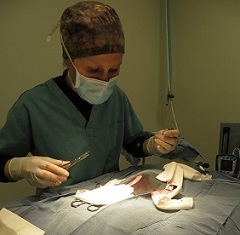 If there are skin sutures, these will usually be removed 10 to 14 days after surgery. You will also need to limit your pet's activity level for a time and no baths are allowed for the first 10 days after surgery. Q: Will my pet be in pain? A: Anything that causes pain in people can be expected to cause pain in animals. Pets may not show the same symptoms of pain as people do; they usually don't whine or cry, but you can be sure they feel it. Pain medications needed will depend on the surgery performed. Major procedures require more pain relief than things like minor lacerations. For dogs, we may recommend an oral anti-inflammatory the day after surgery and several days after to lessen the risk of discomfort and swelling. We use newer medications, which are less likely to cause stomach upset and can be given even the morning of surgery. The cost of the medication ranges from $10 to $15, depending on the size of your dog. Q: What other decisions do I need to make? A: While your pet is under anesthesia, it is the ideal time to perform other minor procedures, such as dentistry, ear cleaning, or implanting an identification microchip. If you would like an estimate for these extra services, please call ahead of time. This is especially important if the person dropping the pet off for surgery is not the primary decision maker for the pet's care.